I am shy & vulnerable & the last thing I am is brave. For brave just think of the people in Zimbabwe. "Brave" the definition of brave used in reference to people like me is difficult to explain. I feel embarrassed when my friends have kindly called me brave or courageous for transitioning. I cannot claim to be either & feel very humble to be thought of in this way. Brave to me & many of my sisters is something that involves a choice. I am one person not schizophrenic yet now I can appreciate looking back that living as Rob may have been a courageous part of my life. I kept running & running away from my soul, refusing to accept my truth could actually be true. Pressured by my own insecurities/fears society & family pressures to try to conform to what I guessed was a masculine sterotype. My mental state had started to crumble quite badly by 2005 when the walkies with lions photo was taken. I had become rather reckless & numb to my feelings. In reality even on a trip of a lifetime I was unable to quieten my gender dysphoria. It roared like a lions call, inside my head. I was the only one who could hear it. If you look into my eyes in this picture they are dead, there is no sparkle. Look behind me & you will see another lion basking in the sun. I was beyond caring for my safety. There were guides around watching our every move but they rightly carry no guns. All they carry are small sticks to distract them. Only last year things went wrong & a tourist got mauled on the same trip. I chose to put myself in this situation. These are real wild animals & if anything went wrong it was me who deserved to die not them. In such an incredible place, experiencing true wonders of this beautiful world, I felt dead inside, nothing except that dysphoric roar tearing my heart out. I felt totally lost in a wilderness. This trip in retrospect was finally the beginning of the end of me masquerading as something I have never been in my life. If you cannot enjoy life in such incredible surroundings with such lovely friends what life do you have? Sharing what may be considered a macho image (see in another life) is very distressing for me. My dear Mum & dad bless them, would cherish this image, of the person they thought was a son. It tears me apart to show this facade, this person. Doing so for 46 years nearly killed me. Even now I cannot really look at it for more than a second or two. I guess seeing this brings back all the pain. In hindsight the bravest thing I ever did was to stop running, listen to my heart & stop to face my fears, my inner beasts my lions. This photo above has captured my creative imagination & one day soon I hope to paint "New beginnings! 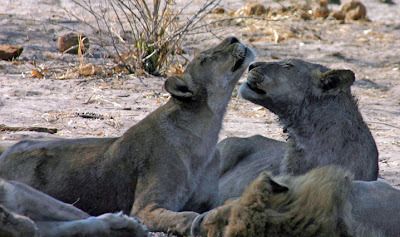 "Is that Lioness being welcomed into the pride being accepted as she is another sister? Why are those two lionesses looking so contented. Is the lion king dead or just sleeping? Did she actually find the strength to kill him herself or could it just be natural causes? For all the poor people there to just have access to the basic necessities of life, is not too much to ask. Zimbabwe's President Robert Mugabe signed a historic power-sharing deal with his long-time rival, opposition leader Morgan Tsvangirai today. The two smiled and shook hands at the ceremony in the capital, Harare, which was attended by African dignitaries. Mr Tsvangirai said the agreement provided the best hope for Zimbabwe and called on President Mugabe to work together to implement the deal. Mr Mugabe said he was committed to national unity and would do "his best". My thoughts & prayers are with them all. Bravery comes in different shapes and forms. I've met some some very brave people in my time, but they would almost never describe themselves as such. You are in good company. Zimbabwe, the bread basket of Africa. I share your hopes. It may turn out the way things are in the world today much more is at stake where most of Africa is concerned. Hopefully this is a positive start. I think that brave must be in the eye of the beholder. Couragous is a another word I would associate with you. Thank you Karen & Anji for your very kind words. Anji I think you are probably right to feel that brave is in the eye of the beholder. Brave to me is what Jo has achieved just by being so talented at public speaking regardless of the gender issues. Being able to present a meeting for the first time in role took an awfull lot of courage. I would far sooner tickle a lion! "My dear Mum & dad bless them, would cherish this image, of the person they thought was a son"
I'm not so sure when it comes to your mother. Everything you post suggests she is enjoying spending time with her daughter. By now she knows you can go anywhere as Debbie ad be accepted. She'll fuss about the operation - but she would about any operation you had. Sadly, I trust Mugabe about as much as I do my own president...and (showing my age)both of them rate lower than Richard Nixon did, which is awfully hard to do! Being is the hardest thing on Earth to do; so many go their whole lives afraid to. I come here and find you and Jo and Nicky doing what you need to to be true to yourselves, and find myself attempting to do so as well! Call it courage, bravery, or heart, you and so many others have more of it in your little fingers than most of us do in our whole bodies! Thank you for calling me a friend!